This step allows you to adjust the display and rendering of the USG cells, and also edit the attributes of individual cells or zones. For a saturated groundwater flow model, there are three parameter groups: Conductivity, Storage, and Initial Heads. By default, hydraulic conductivity will be displayed, and rendered by the ZoneID. In order to see another parameter group, you need to turn off (remove the check box beside) Conductivity from the tree, and turn on (place a check box beside) the new desired parameter group (eg. Initial Heads). Property zone values can be assigned directly to selected numerical cells using the Assign options from the toolbox. Select the Edit button to edit Property zone values after they have been assigned and the Edit property dialog is launched. Here you can select the zone and then you will have the ability to edit any of the cells that are part of the zone. Also available is the Script tab. If preferred you can make your edits by using the Scrip option. On this tab you will find the script for any edits you make on the Edit Cells tab allowing you to learn the script language. You can then use the script to "replay" the same edits again. •Under Cells, there is no option for "Show Only Borders"
•For Lines, there is no option for "Show Only Grid Frame"
•For Slice, there is an option "Show Cell ID Labels"; this will insert the MODFLOW-USG CellID for each cell, for the selected slice. This will be useful if you want to adjust the numerical values for single cells (or a group of cells) using the Edit option described below. •For Slice and ThreeSlices, the slice position for cross-sectional slices is based on a virtual grid; the UnStructured grid is divided into 100 equally spaced rows and columns. You can display cross-sections through the USG, as "rows" or "columns", at positions from 1 - 100. Row 1 corresponds to the Y minimum in your model domain, whereas Row 100 corresponds to the Y maximum in your model domain. Column 1 corresponds to the X minimum in your model domain, whereas Column 100 corresponds to the X maximum in your model domain. The layer convention follows the MODFLOW notation, where Layer 1 is at the top. 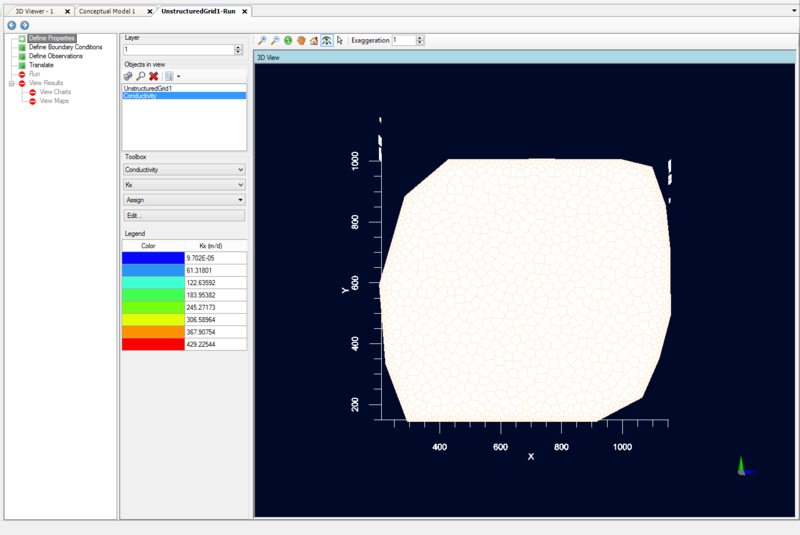 •For Colormap, the positions are similar as to what you have for Slice described above. The option to display colormap along an arbitrary Cross-section line is currently not supported. For Colormap, there is an additional Slice Type, "Horizontal", which allows for rendering on a flat horizontal plane. In this case, you define the vertical position (shift) of this Horizontal plane, on a location from 1 - 100. Vertical Shift of 1 corresponds to the Z minimum in your model domain, whereas a shift of 100 corresponds to the Z maximum in your model domain. Only active cells in the model domain will be drawn. •For Isolines (contour lines), the settings for selecting the plane for drawing the isolines are similar to described for Colormap above. Any of the model properties can be exported to shapefile for further post-processing; see Export for more details.